It felt like fall this morning with brisk air and rain on and off in spurts. It is spring here in Australia and a cold front is moving through with some rain and possible thundershowers. I’ve really enjoyed it and like this type of weather. This is unseasonably cool for this time of year and I’ve just lucked out because it’s usually bordering on being quite hot. The family that’s giving me a ride to the trailhead today is the Gibbens-Johnson family. They are from Sydney and are on the third week of a three month road trip and they also keep a daily blog that they update as they travel. Morning view. That cliff in the sun is coming over is where the final scene of the popular NZ film, Priscilla, Queen of the Desert was filmed. Not super clear, but I finally got a bird shot. They don’t sit still long. The parents, Mandy and Joel have quite the full tour of Australia mapped out. 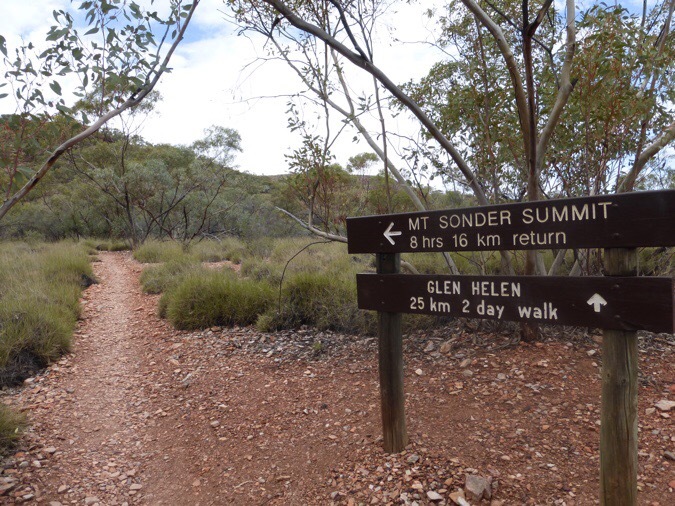 They are taking the Mereenie loop to Alice Springs, which is a permit only (Aboriginal land) road that requires a vehicle that can handle a rougher road. The road is mostly hard packed sand/clay. It has a corrugated roadbed that makes for lower speed. 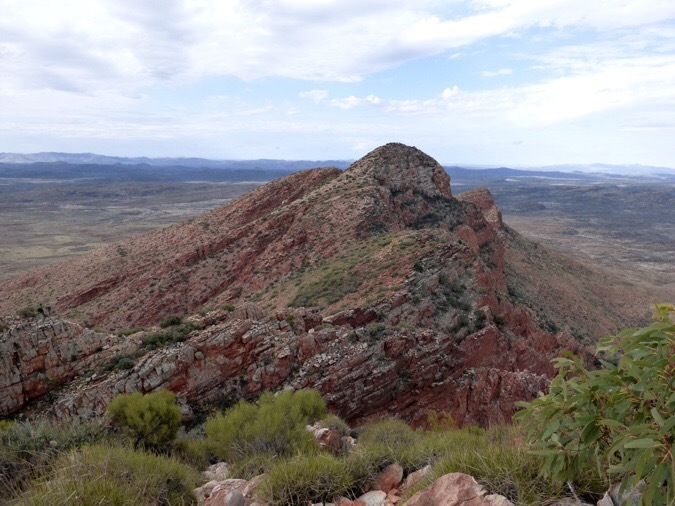 Basically, it’s a way to drive parallel to the Larapinta and still stop off to day hike or see the main sites. We got started just after 9am after a couple hours of packing up. It was cool to see how their large pop out trailer folded back together. 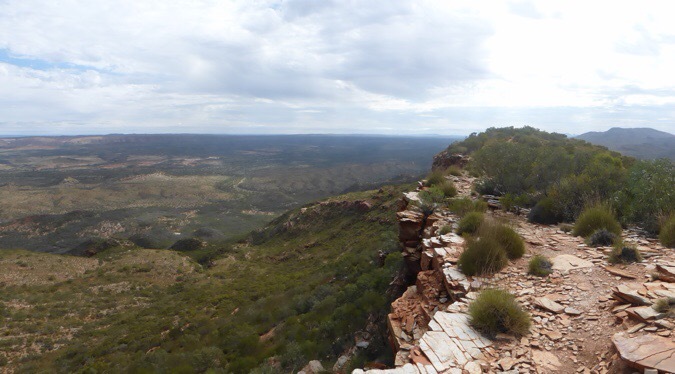 I heard it took around 3-4hrs to drive to Redbank Gorge from Kings Canyon Resort on the Mereenie Loop. 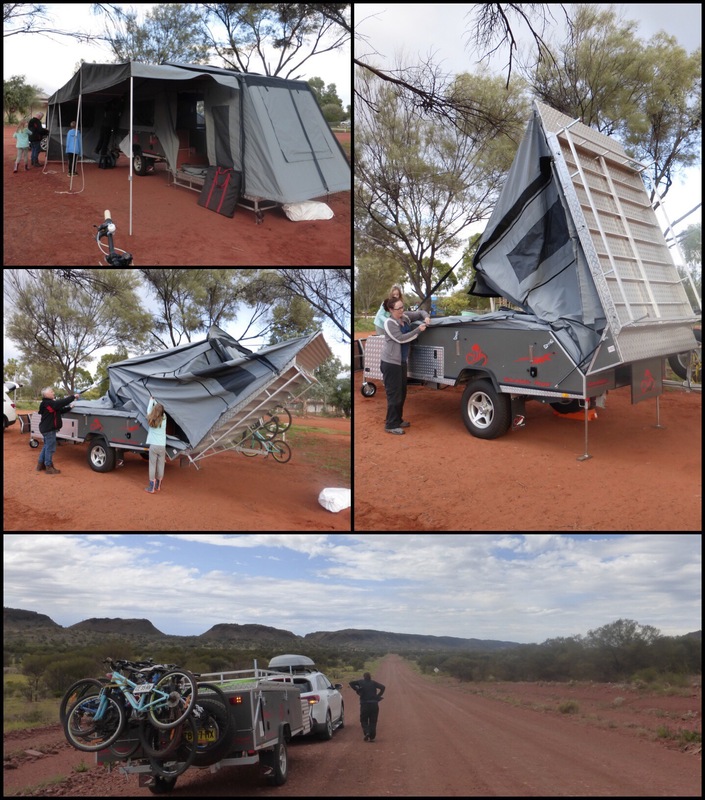 We did it in 4.5hrs with some stops along the way and driving with the trailer on the back. It was a nice drive and the road was still plenty dry given the periodic rains the last few days. 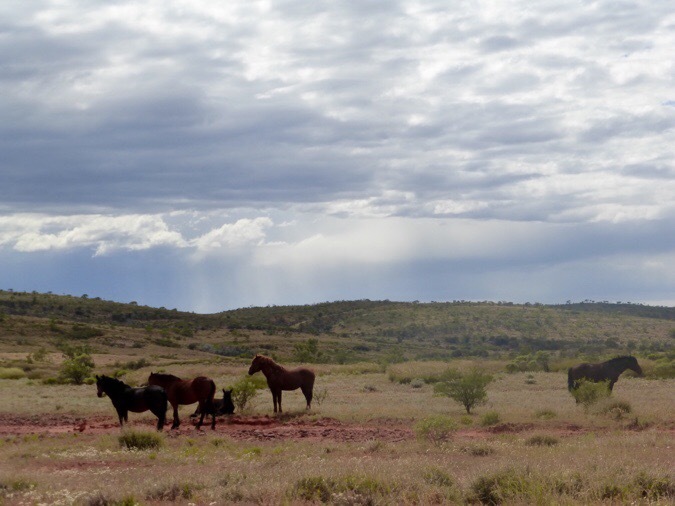 We saw wild horses called brumbies here. Apparently, the road gets closed off if it rains too much. 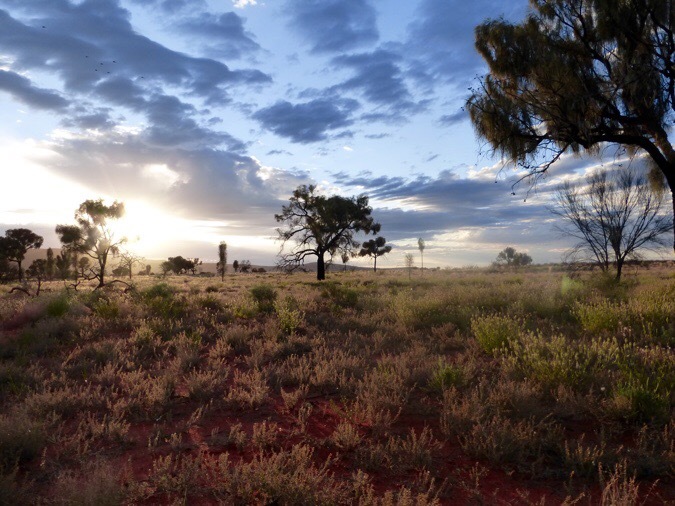 If you drive from Alice Springs, it’s mostly a paved road coming from that direction. 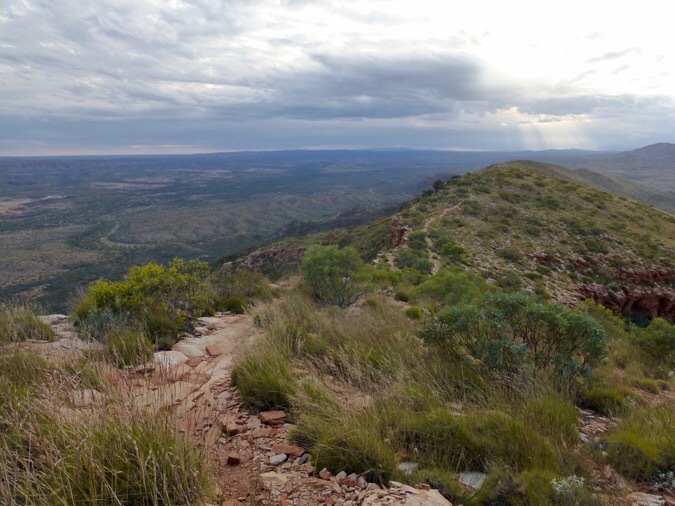 The last 2.5mi/4km that turns off to Redbank Gorge is a bit rougher. By the time we got to the trailhead and ready to go, it was 2pm. The temps thankfully warmed just enough to not be brisk in the wind at 59F/15C There is a short side hike to see the gorge that I had hoped to do with the Ginbens-Johnsons, but I was worried about having enough time to hike the first section of the Larapinta (to the top of Sonder Mtn and back) before dark, so we parted ways where our paths split. I’ll check out the gorge tomorrow morning. 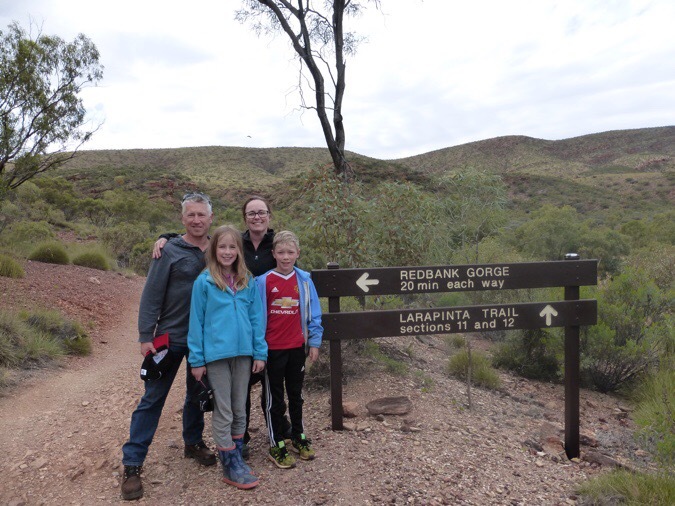 THANK YOU to the Gibbens-Johnson family and don’t forget to to check out their travels on their blog as well. THANK YOU Joel, Mandy, Eva, and Jack! I quickly went over to the camping area and pitched my tent so I could throw most of my things in there and then head up to do Sonder Mtn. 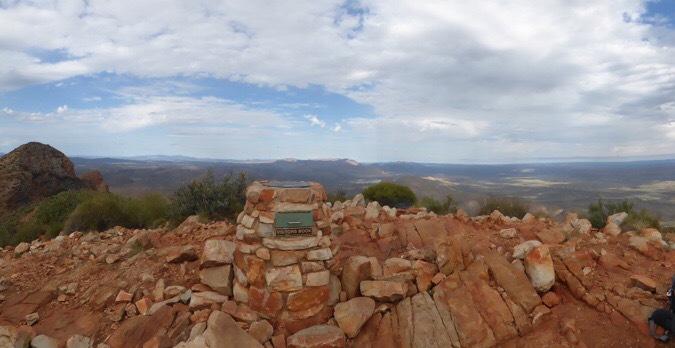 Similar to the John Muir Trail and Appalachian Trail, the western terminus of the Larapinta is up on the lookout of a mountain. It is a 9.4mi/15.1km round trip to the viewpoint and back to camp with 2329ft/710m of gain to get there. Both the guidebook and local signs give generous estimates on how long it would take. I had just under 5hrs before dark and figured I could make it, but that it might be close depending on terrain. Can I make it back in under 5hrs?? The hike up was enjoyable. It was a bit rocky, but I was able to keep a good pace so I didn’t cut it too close to make it back down by 7pm. Days are getting longer now here, but it is still dark that early. It is odd to experience this all over again as the opposite is now happening back home in the US. I won’t have a winter this year, which is great, but feels weird. 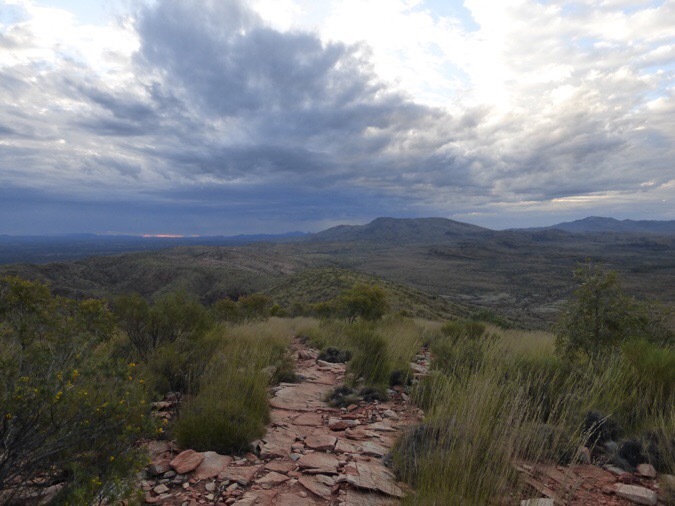 Once up to the ridge, the hike is mostly a nice ridge walk with expansive views in all directions. 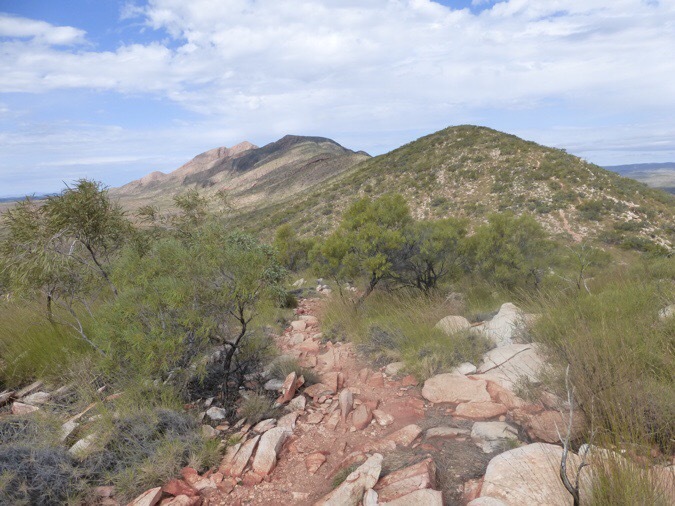 This is intended to be the end of the Larapinta with a finale at the top of the Northern Territory’s fourth largest mountain, but I think I’m hiking against the grain. Some go this direction, but not most I think. I’ll find out as I hike. I like knowing I’m headed back to town and won’t have to find a ride at the end. 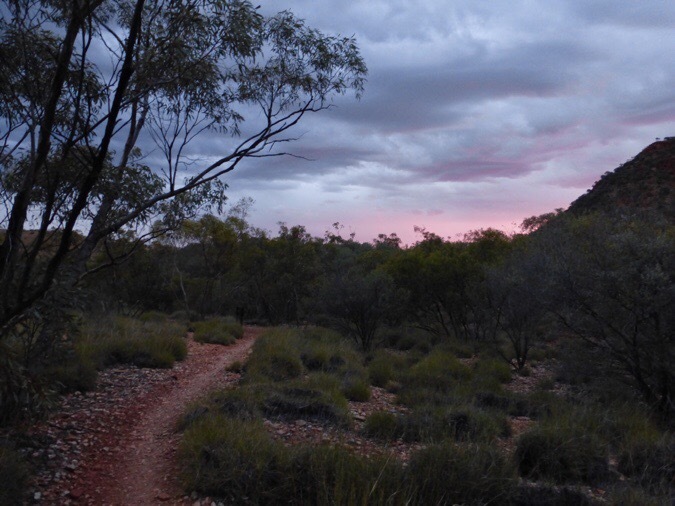 I can walk into town and know I’ll make my flight out to Perth (where the Bibbulmun Track begins) the following day. There was a register at the start and it seems someone started 24hrs before me and many finished here in the last couple days. Looking back where I came from. I saw a few pairs/groups coming down as I headed up. I got to the viewpoint and had it all to myself and it was really enjoyable and peaceful. There is a nice pedestal with a register and the top had a compass and labeled surrounding landmarks. 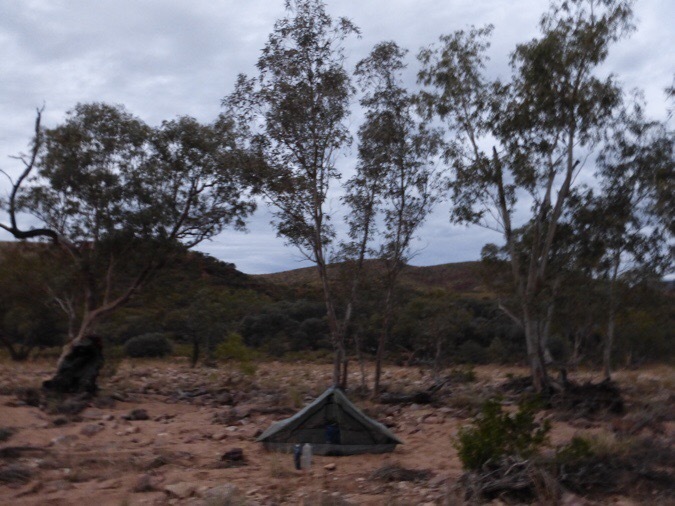 Alice Springs, directly east, about a week of walking ahead,143.5mi/231km. Funny thing with the lookout is that it isn’t the top of Mt Sonder. I don’t know if many know it (the family I spoke to on their way down had no idea), but the actual summit is just to the north on another point that requires some scrambling for half a mile. 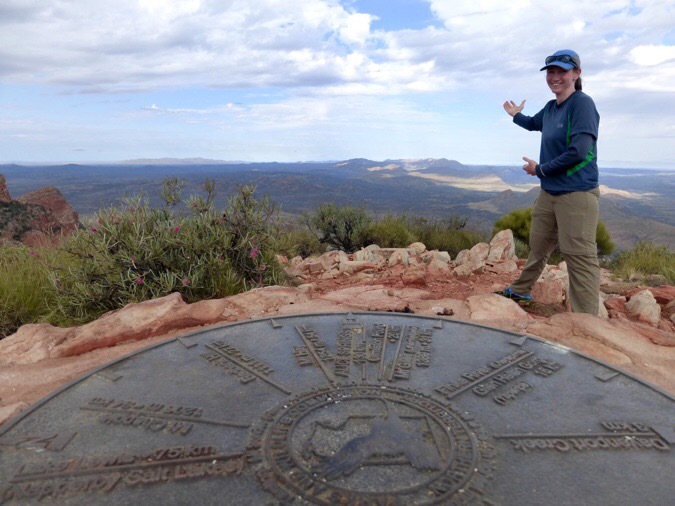 Given my timing and the fact that I’m not really a peak bagger (unless the view is worth it), I was fine with the lookout, which is the official route on the Larapinta. The guidebook actually cautions against doing the summit for most hikers unless they are comfortable with scrambling. The actual summit of Mt Sonder. Yes, I think it looked totally doable, but I was quite content with the lookout. Plus, I had full service to post yesterday’s blog! It may be my last service for a week, so I soaked it up and watched the clock, sure to leave in time to make it by dark. I was able to jog down much of the way. The winds were picking up and dark clouds were coming in. I made it down to some great pink and purple skies. I heard sunset is nice up there, but the clouds blocked it. I made it down at 6:45pm, just as it was getting dark. I got water from the tank and was happy to have a tent already up and waiting for me. There are hardly any, if any, natural water sources along this route so my water sources will be these awesome tanks that are filled by either rain or man filled. Pretty great that they have these and they will also have them out on the Bibbulmun when I hike there. It still recommends that hikers treat the water before drinking. I have proudly challenged myself this hiking season to filter all my water (using the Sawyer Squeeze) rather than resorting to bleach. In the past, I tended to use the bleach a lot (2 drops per liter) because it is less time consuming, but with 9 months of hiking this year, I figure I should cut out all that bleach and take the time to filter healthier water. The Squeeze is really fast anyway and works great. In the past, I only used it with water that had debris in it. 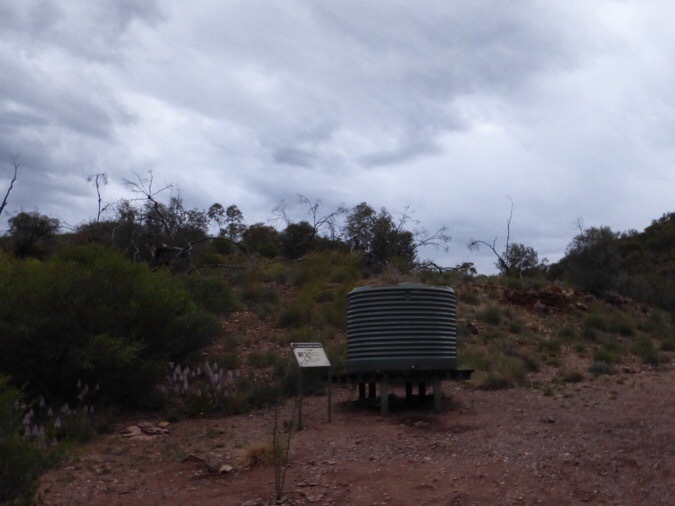 One of the many water tanks along the Larapinta. I got in the tent and made dinner. There are three tents in the area but we are just out of sight of one another and all had retreated for the night by the time I came down. No easy dehydrated dinner meals this trip as I wasn’t sure what I could bring over from the US. Turns out I could have brought them (I think NZ is stricter). I have some pasta Knorr sides and mac and cheese. I used that purple methylated spirits for the first time and was glad I was camped in sand. It was a pretty wild flame and left black soot on my pot and pop can stove. I wonder if it’s just the purple stuff that does that cause that was a pain and the flame was frighteningly wild. I’ll have to work on a better strategy. It lightly rained on and off as I made dinner from the tent. Couldn’t have timed it any better. Yep, totally nailed it! Another great day in the books. Excited to bring some of these trails to light that aren’t as known in the US…and apparently out here as well! It is certainly the ‘green centre’ that you are seeing with such great temperatures to hike in. What a wonderful day. I love all your photos. Loving this journal and learning so much already! Brombies .. ur soo cute !! 🙂 they are actually called “Brumbies” ..but u were close !!! hahaha..
what a lovely family to give you that ride..and an amazing camper/tent they have..! its pretty wild country out there.. you might even run into an aborigine on his “walkabout” .. that would be way kewl if you did ! Oh no! I’m fixing that when I get to town! You might try Aquamira to avoid the hassle of filtering. It seems slightly better than bleach because it is similar to what is used to treat many urban water supplies. But not as quick as bleach since you have to mix two different chemicals and wait a few minutes. You don’t need to use the full amount (8 drops each per L) unless the water is really dirty. Where I hike most (Cascades) I often don’t treat the water at all, but I wouldn’t recommend that in a new area, and as you know one has to work up gradually to untreated water to reduce the chance of getting sick. Have fun on this amazing trip! I’m terrible with patience and don’t like the 5min wait and dealing with the Aquamira drops. I can’t tell you how many people have used my filter or bleach after having their Aquamira unexpected run out or spill somehow. The Sawyer has been perfect and super quick out here! Welcome to Australia! It is interesting to read your impressions. I note that you are also going to do the Bibbulmann. The southern half of that track is the best, and hopefully you will be there at wild flower time. Worthwhile side trips would be the Stirling Ranges and the nearby Porongorups, both of which lie between Albany and Perth. Talking about meths, or metho as it is called out here, I use this fuel and don’t have the sort of flare ups that you describe. I use a Trail Designs Caldera Ti Tri. However, I only ever use very small amounts at any one time, usually 10 to 15 ml. I don’t get any soot on my pot – I think that comes with flare ups – although my pot does blacken. If one adds a very little water to the fuel in the burner I think you will find that that stops the soot build up, although it does increase the boil time a bit. Friends do this, but I stopped doing it years ago. Might be worth a try. Enjoy your trip. Next time you come out here I will take you on some off track wilderness walks!! Thanks for those side trip recommendations. I’ll keep that in mind and look into them. As for the maths, I think it’s the purple stuff that is causing the high burn and spot on the pot that is all over everything. Hoping that changes now that I’m getting the clear meths in Perth. Interesting to see that in the USA you use bleach to treat water for drinking. In Australia a popular purifier is an iodine-based antiseptic called Betadine. One buys it from pharmacies. It comes in dropper bottles as small as 15 ml. We use 8 drops to a litre of water and then leave it to “sit” for 15-20 minutes. It does flavour the water a little but it is not too bad and I would think iodine is better for one than bleach. I carry it anyway as part of my first aid kit, so it is always there if I need to purify the water. Mind you, in most wilderness areas in Australia I don’t treat the water although I am careful about the state of the creek. Fuel is heavy but boiling water for 1 minute kills just about everything bad so for cooking or tea/coffee I never bother to purify the water first. What an awesome start you’re off to in this new and beautiful land. Your friendly confidence and spirit, ability to always see the bright side of things, and calm adaptability will stand you in good stead over the coming months of new challenges and opportunities to develop your already crazy-amazing hiking chops. It’s freshly exciting, in a different way, as a reader – as well as for you, of course! – that you’re hiking not only in a stunning new continent but are on your own again w/the attendant pleasures and differences. I’ve loved “our” haha, exhilarating past months on the high routes with amazing old friends but also look forward with much anticipation to this epic Wired-solo journey. Wishing you safe, satisfying, interesting days and cozy (Aussie-birdless) nights. Onward! I completely agree just as many of you. It’s been great to be with friends on those unique routes, but it’s time to get back to these solo journeys and all the fun those entail. It’s pretty fun to do this solo stuff! Nancy stayed at our place when she did the Te Araroa, we live about 50 Km from the end of the trail at Bluff, just a comment you made about getting food into NZ, anything that is in an unopened package should be alright, unless you get someone that is wanting to pick on you for no reason. So glad you made if there safely and are on your way. I really enjoy your pictures and often imagine what it much be like to see all if this incredible landscape that you’ve visited over the last few years. Take care, be careful and enjoy yourself as I know you will. Great post. I’m a bird lover. 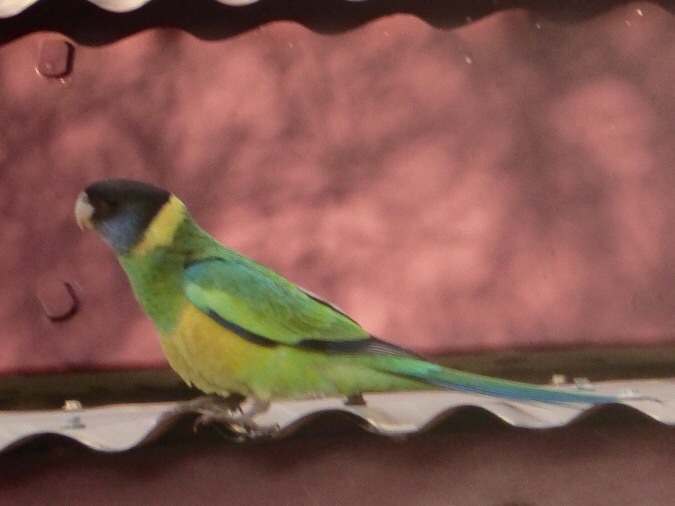 The bird is an Australian Ringneck. 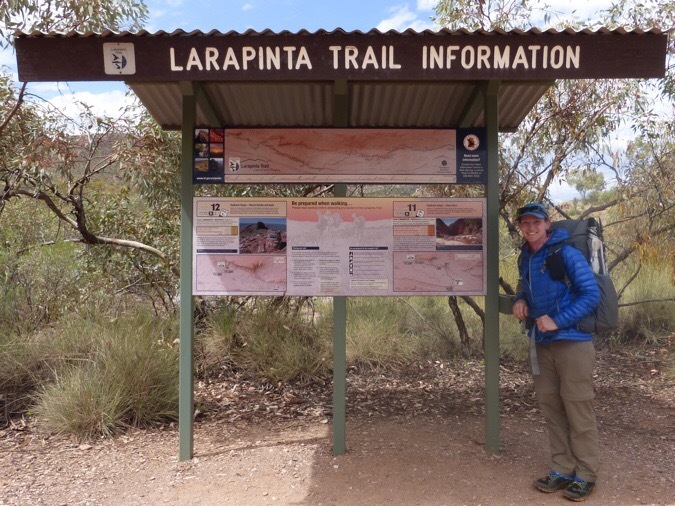 Looks like you had a great start on the Larapinta. Hope it goes well for you. And hope you get your stove fuel situation figured out. You got me curious about those horses, so I looked ’em up and found a great website about them: http://www.ansi.okstate.edu/breeds/horses/australianbrumby/. I hope you’ll see more of them; they’re beauties! I’m heading to Australia to visit my daughter. If you could only do one hike their which would u do ? Hmm, I only did three, so I’m not expert. Also, Australia is HUGE. If you’re near the Larapinta, I say go for it cause it’s unique and off the more traveled stuff. I don’t know how long of a hike you’re looking for, but I really enjoyed the 1000km Bibbulmun on the west side of the country.